Home / People / Joseph S. Rocco, Jr.
Jockey Joe Rocco Jr. missed a third consecutive day of riding on Thursday’s racing program. Rocco was injured in a starting gate mishap prior to the second race on Sunday. Rocco injured his ankle and shoulder when he was tossed from the saddle by his scheduled mount, Desert Dew, who was scratched from that race. That mount was to have been the first of the day for Rocco, who cancelled his mounts for the remainder of the Sunday program. 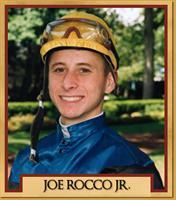 Jockey Joe Rocco, Jr., injured in a spill on Saturday, took off his mounts on Sunday. Rocco plans to return to riding later in the week. Jockey Joe Rocco Jr. took off his mounts for the second consecutive day Saturday. Rocco was unseated at the start of Wednesday's sixth race when his mount, Success, Rate, broke through the gate. "When Joe went down the other day he sprained his neck," said Rocco's agent Joe Burdo. "It's just been a little sore. He's been taking it day-to-day, but we're hoping he will be able to ride (Sunday)."